Maxpower Industrial Co. ltd is one of the leading rechargeable battery and charger manufacturer in China which integrates R&D, production and sales of Nickel Metal Hydride, Nickel Cadmium, Lithium-ion, Lithium Polymer rechargeable battery, and chargers. We have our modern production base in China with a total plant area of 30,000 square meters and about 1000 employee including 80 R&D engineer and 100 professional QC staff. Our products are widely used in consumer electronics and industrial equipment like cordless phone, mobile phone, Iphone, Ipad, PDA, RC hobby, power tools, emergency lighting, Flash light, UPS, electric motorbikes, electric bus, vacuum cleaner, medical device and so on. We mainly export to Europe, Japan, US, South Korea and other countries in the world. Since our establishment, we focus on high quality, excellent pre or after sales service and take responsibility for each cell we produce. 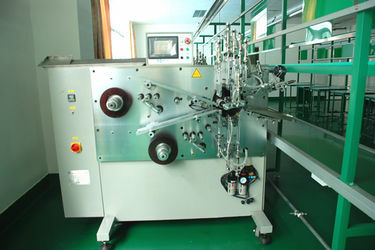 Some of Global Top 500 companies have already cooperated with us due to our good fame from domestic and oversea market. Since its inception, Maxpower has strictly applied the ISO9001 quality management system to ensure product quality. In addition, we are also certified with the ISO14000 environment management standard and all our products are compliant with SGS testing, CE, UL，REACH and RoHS., We aim to be first class energy supplier in China through our mutual effort and support. Welcome you to be our local agent or distributor at your market. We’re just here always for you! October 2001 was formally established. 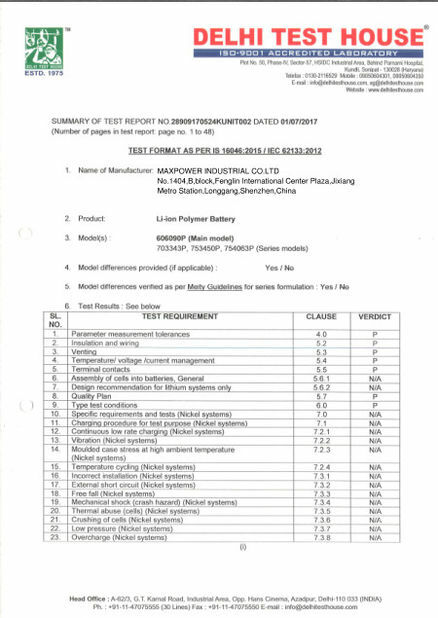 January 25, 2002 obtained ISO9001: 2000 certificate. Feb.2003, set up the research center to develop NI-MH high capacity battery. 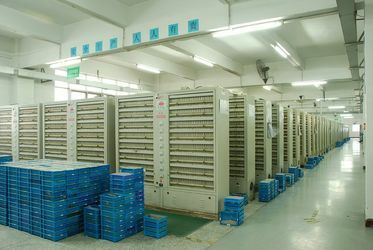 May,2004, develop ni-cd high temperature battery for our Europ light factory customer. March 2005 Set up Electric Division, research the intelligent charger of AAA,AA,C,D,9V size battery. Feb.2006, set up li-ion battery cell dep. for India, south afirica and middle east market. 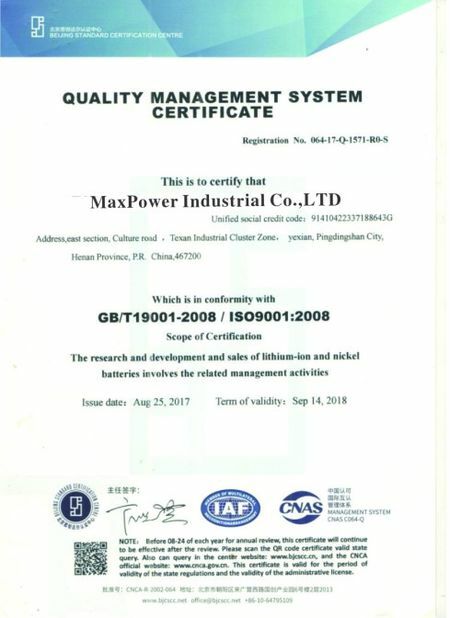 July 2007 maxpower get the ISO14000, and SA8000 certificate and start to supply Europ supper market of hight capacity battery. Meanwhile develop the li-polymer battery. Jan. 2008 maxpower buy the jiangxi YICHUN one industrial zoo land and shift the li-ion battery production to Jiangxi. May 18, 2009 obtained ISO9001: 2008 certificate. Apr. 2010. shift our NI-CD battery dep. to Jiangmen to support our customer competitive price. 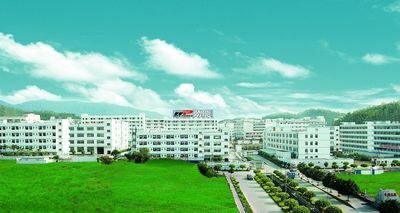 Aug.2011, cooperate with HIT university to strengthen our research ability. Jun.2012, separate our foreigh sales dep. from factory to concentrate the oversea market develop. Jan.2013, set up sourcing dep. for our cooperating customer items in foreign sales dep to give our customer all solution to develop their bussiness. OEM and ODM order is welcome. And we give you customised solution for industrial use battery pack. Maxpower sets up the human resource development strategy scientifically to ensure the company's stable growth. Firstly , maxpower puts the emphasis on the "staff management". The decision-maker must change the idea and focus on the modern management model, of which the center is staff-training and human resource developing. Secondly, our company founds the scientific training system to help the staff to design their career, and raise their stability and loyalty. Besides that, by the means of "working performance index", MP is aiming to applying the new human recourses management system to control and monitor each function procedures. Finally, from set-up in the year of 2001, MP productivity is growing rapidly. 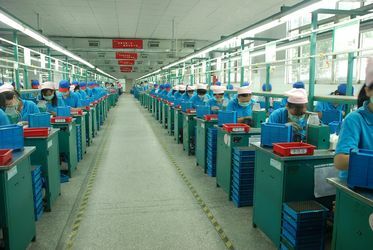 It's mainly because company not only emphasize the manufacturing, customer and market situation, but also the company's culture management. It lets everyone feel at home here in maxpower. Nowadays, MP has 25 engineers, 30 QA, 10QC, 35 sales, 800-1000 labor worker to running our different dep.